The "set and forget" model CH-1 single-bay rapid battery charger is designed with your busy crane remote fleet in mind. A fast and accurate charge every time, tailored to each individual battery's needs, keeps your portable devices humming for a full shift and more, day in and day out. Different battery chemistries- NiCd, NiMH, LiIon or LiPo batteries have different charging needs and end-of-charge parameters. Use of an incorrect charger can severely damage or shorten the service life of your batteries and cost you money in unnecessary replacement expenses. The CH-1 microprocessor-controlled charger circuit automatically senses the chemistry of any battery inserted, and delivers the optimum charge algorithm to provide a safe, full charge in the shortest time possible. Most batteries will fully charge within 2-4 hours. When charging is completed, the charger will switch to trickle mode to ensure that batteries can be left safely for a longer period (e.g. overnight) if desired, retaining maximum charge until removal. 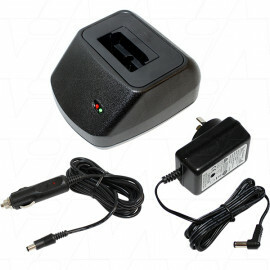 The charger is independently powered with 1.0A current. The charger comes with one SAA approved 12V 2A power supply, one 3Mtr 10-20VDC Cig/Auto Socket input + 2.5mm DC plug (Centre Positive) and one adaptor cup.